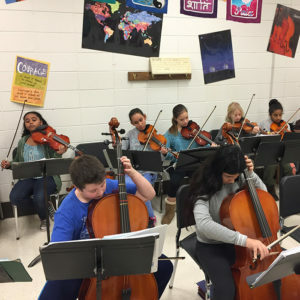 Bemidji’s Schoolcraft Community Learning Charter School was coming up short on stringed instruments for the school’s elementary and middle school orchestra program. Vega provided eight violins and one cello so that more students could participate in the school’s music programs. “Schoolcraft has been very excited to accept the donated instruments! Our current instrument inventory was next to nothing and all instruments used in orchestra have been rented or purchased.” – Bernadette Aguilera, Schoolcraft mom and substitute teacher. Subscribe to our newsletter. No spam! Just updates on what we're doing. © 2017 Vega Productions. All Rights Reserved. Website by Bad Ash Babe and 48 in 48.